[M. grandiflora], cv. (Magnolia 25(1) [Issue 47]: 19, 1989). 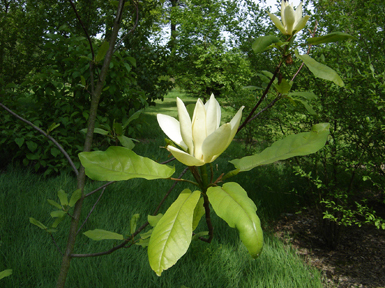 ‘Listed as a selection with blunt-tipped leaves in Magnolia 23(2) [Issue 44]: 4, 1988. 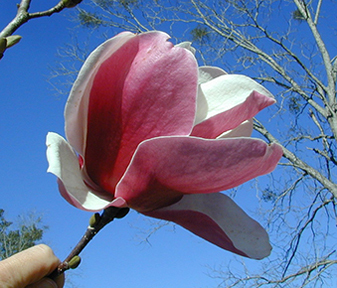 Introduced by Magnolia Nursery, Chunchula, Alabama. [M. denudata], var. (Finet & Gagnepain) Pampanini, Bull. Soc. Tosc. Ort.40: 200. (1915). basionym: M. conspicua var. fargesii (Finet & Gagnepain, Mem. Soc. Bot. France 1 (4): 38. 1906). in Dandy, Notes Roy. Bot. Gard. Edinb. 16: 123 (1928) = M. biondii. [M. campbellii], F. (Hillier & Sons, Cat. Trees & Shrubs, P. 23, Autumn 1945 - Spring 1946, Winchester, England), as M. mollicomata cv. Fastigiata. ‘We offer young trees raised from seed from a selected, erect, branched tree.’ (forma of ssp. mollicomata). [M. kobus], cv. (Wada, Jap. Gard. Treas. p. 36, Hakoneya Nurseries, Numazu-Shi, Japan, circa 1925), ‘A very twiggy dwarf grower, forming ultimately a beautiful shaped bush and eminently desirous for the plantation as a single specimen.’ Compare M. Kobus cv. Nana Compacta. [M. salicifolia], cv. 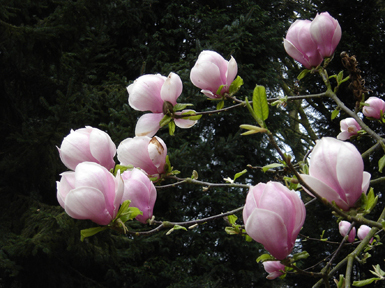 (Millais, Magnolias, photo opposite p. 212. 1927) = cv. Fasciata. [M. grandiflora], cv. (Fogg, Newsl. Amer. Magnol. Soc. 3 (1): 5. 1966), photo only. = cv. Praecox Fastigiata. [M. liliiflora, M. x soulangeana], cv. (Callaway, Dorothy J. The World of Magnolias, p. 225, 1994). ‘This cross was made in 1953 by Richard A. Fenicchia of Rochester, New York. ‘Fenicchia Hybrid’ flowers later than Magnolia x soulangeana, thus excaping some frost damage. Flowers are reddish purple and larger than those of M. liliiflora. 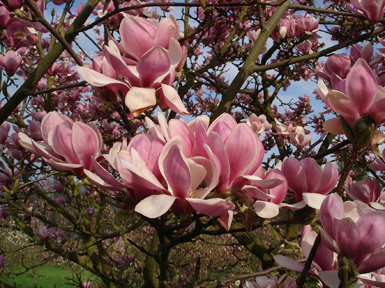 The tree is more vigorous than either parent, displaying hybrid vigor.’ (M. liliiflora cv. Nigra x M. x soulangeana cv. Lennei). [M. grandiflora], cv. (Nouv. Dict. Hist. Nat. 13: 520. 1803), ex Pampanini, Bull. Soc. Tosc. Ort.41: 101 (1916), with flowers precocious. In Pampanini, op. cit. p. 105 = cv. Rotundifolia. [M. grandiflora], cv. (sic) Mouillefert, Traite 112. 1891), probably = cv. Ferruginea. [M. cylindrica, M. denudata], cv. (Magnolia 22(2) [Issue 42]: 11, 1986-7). ‘Symmetrical, upright, single trunked tree with thick leathery leaves. Flowers produced well before the leaves open; six broad, bone white tepals, with vivid magenta-pink lower third and stripe to tip.’ Registered by Phil Savage, Jr., 2150 Woodward Ave., Bloomfield Hills, Michigan 48013. (M. cylindrica x M. denudata cv. Sawada's Pink). [M. campbellii, M. x soulangeana], cv. (Callaway, Dorothy J. The World of Magnolias, p. 225, 1994). ‘This form is the result of hybridizing work by Oswald Blumhardt of Whangarei, New Zealand. ‘First Flush’ blooms quite early in the spring. 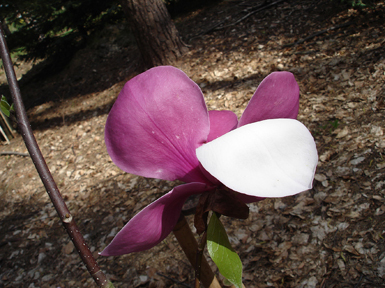 Flowers are white and flushed with pink on the lower half of the outside of the tepals. Named by Blumhardt in 1982.’ (M. campbellii x M. x soulangeana cv. Amabilis). [M. liliiflora], cv. (Pampanini, Bull. Soc. Tosc. Ort.41: 139. 1916), leaves ovate-rotund, 9-15 cm. long, 13 cm. wide, briefly acuminate. Flowers pale rose, delicately perfumed. This is considered a hybrid of M. denudata and M. lennei. (therefore this) = M. x soulangeana cv. Fischeri. [M. x soulangeana], cv. (Exotic Nursery, Chelsea, London, England, 1849), per Loudon, Hort. Brit. 584 (1850), as M. fischeri, nomen nudum. syn. : M. yulan cv. Fischeri (Van Geert, Cat. #71: 112. 1874, Ghent, Belgium), nomen nudum; M. (hybridae) fischeri odorata (Van Houtte, Cat. 4163: 45, 1875, Ghent, Belgium), nomen nudum; M. conspicua cv. Fischeri (Lavallee, Arb. Segrez. 8. 1877), nomen nudum. Mouillefert, Traite 119 (1891), leaves round. Gard. Chron. III, 9: 590 (1891), ‘flowers purple.’ syn. : M. obovata b. fischeri (Dippel, Handb. Laubh. 3: 151. 1893), flowers carmine-red outside, white inside, round to oval, 9-15 cm. long; M. liliiflora var. fischeri (Pampanini, Bull. Soc. Tosc. Ort.41: 139. 1916), leaves ovate-rotund, 9-15 cm. long, 13 cm. wide, briefly acuminate; flowers pale rose, delicately perfumed. Considered a hybrid of M. denudata and M. lennei. [M. acuminata], var. (Small, Man. SE. Fl, 534. 1933), flowers yellowish, given as Tulipastrum acuminatum flavum. = M. acuminata f. aurea. [M. grandiflora], cv. (Bouche & Bouche, Blumenzucht 2: 716. 1855), nomen nudum. [M. x soulangeana, M. x veitchii(? )], cv. (Otto Eisenhut nursery catalog, p.3, 1989, Ticino, Switzerland). ‘LA 82.’ Nomen nudum. Syn. : cv Prince Charming. [M. grandiflora], cv. (Leroy, Cat. p. 7. 1850, Angers, France), ‘double flowering.’ compare cv. Exmouth Double and cv. Exmouth. [M. liliiflora], cv. (Pampanini, Bull. Soc. Tosc. Ort.41: 139. 1916), flowers double. syn. : M. obovata cv. Flore Pleno, loc. cit. [M. nannetensis], cv. (Madlinger, Bull. W. C, Paul Arb. l. 1960, Memphis, Tennessee), nomen nudum = M. grandiflora cv. Nannetensis. [M. sieboldii], cv. (Wada, Jap. Gard. Treas., circa 1925, P. 36, Hakoneya Nurseries, Numazu-Shi, Japan), as M. parviflora cv. Fl. Pl., described as ‘A double form of the type composed from about 36 petals with a showy disc of stamens.’ probably = cv. Kwanso. [M. stellata], cv. (Contini E Nava, Cat. p. 11. 1900, Intra, Italy), as M. yewlan var. Flore-Pleno, per Pampanini, Bull. Soc. Tosc. Ort.41: 173 (1916). flowers very double, merely listed in Beissner et al., Handb. Laubholz-benennung 99 (1903). [M. virginiana], cv. (Jaeger, Ziergehoelze 304. 1865), flowers double, as M. glauca cv. Flore Pleno. Possibly cv. Burchelliana or cv. Gordoniana. [M. rustica], cv. (D. W. in Gardening Illustrated 33: 449. 1911), nomen nudum. J. Veitch & Sons, Catalog NO. 15, P. 70, per Pampanini, Bull. Soc. Tosc. Ort.40: 201 (1915), in synonymy. = M. x soulangeana cv. Rustica Rubra. [M. sinensis], cv. (Otto Eisenhut Nursery Catalog, p. 5, 1989, Ticino, Switzerland). 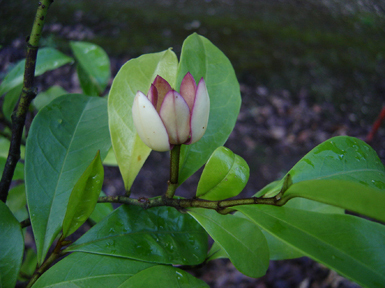 ‘(U. Grau) doubled flowered, flowers 3 weeks earlier than the original Sinensis.’ = M. sinensis cv. Ursula Grau. [M. grandiflora], cv. (Loudon, Encycl. Trees & Shrubs 23. 1842), grown by Leroy in Angers, France. Leroy, Cat. P. 79 (1873), very floriferous. In A. & E. Kay, Pl. World Fla. 33 (1933), growth-dwarf, dense, irregular; leaves small, undulate; very floriferous. In Nehrling, My Garden in Fla. 103 (1944), ‘bears immense crops of flowers of small size.’ M. floribunda (Koch, Hort. Dendr. 5. 1853), nomen nudum, may be a synonym. [M. grandiflora], cv. (Sprenger, Bull. Soc. Tosc. Ort.32: 86. 1907), EX Pampanini, Bull. Soc. Tosc. Ort.41: 187 (1916), nomen nudum. [M. grandiflora], cv. (Nehrling, My Garden in Fla. 104. 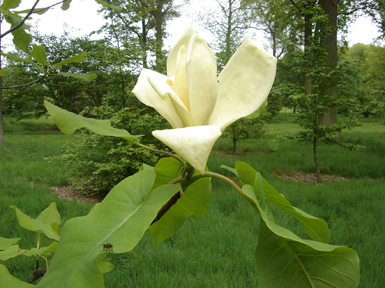 1944), growth broad, dense, pyramidal; leaves glossy, large, whitish beneath with blackish spots; flowers abundantly. [M. foetida], var. typical variety = M. grandiflora. [M. acuminata], cv. (Pampanini, Bull. Soc. Tos., Ort, 40: 154. 1915), leaves variegated with white. Compare M. cordata cv. Folis Variegatis (van Geert, Cat. #71: 112. 1874). Probably = cv. Variegata (Ellwanger & Barry, Descr. Cat. p. 4. 1855). [M. acuminata subsp. subcordata], cv. (van Geert, Cat. NO. 71, p. 112.. 1874, Ghent, Belgium), nomen nudum, as ‘Fol. var.’ See M. acuminata cv. Foliis Variegatis. [M. grandiflora], cv. (Leroy, of Angers, France, circa 1842), ex Loudon, Encycl. Trees & Shrubs 23 (1842), nomen nudum. in Pampanini, Bull. Soc. Tosc. Ort.41: 101 (1916), mentions Leroy, 1844. leaves variegated with white. [M. grandiflora], cv. (Sprenger, Bull. Soc. Tosc. Ort.32: 86. 1907), leaves variegated yellow. in Pampanini, Bull. Soc. Tosc. Ort.41: 187 (1916). Compare cv. Variegata. [M. grandiflora], cv. (Borromeo, in letter dated 6 June 1915 to Pampanini, Bull. Soc. Tosc. Ort.41: 10l. 1916), foliage very wide. Cultivated on Isola Borromeo, Italy. [M. campbellii], cv. (Donald E. Healey, circa 1961, Everett, Wash.), as M. mollicomata cv. Forrests no. 2, nomen nudum. (cv. of ssp. mollicomata). [M. denudata], cv. (Magnolia 20(1) [Issue 37]: 16, 1984). ‘Flowers a pure clear pink’ (News. Amer. Mag. Soc. 15(1): 23, 1979). [M. grandiflora], cv. (Treyve, at Trevoux (Ain) France, circa 1871), ex Pampanini, Bull. Soc. Tosc. Ort, 41: 102 (1916), foliage compact and pyramidal; flowers very large and abundant. [M. liliiflora, M. x veitchii], cv. (Magnolia 20(1) [Issue 37]: 16, 1984). ‘A Gresham hybrid with huge deep pink campbellii-type flowers 10-12 inches across, creamy white inside with 12 broad tepals. Vigorous upright habit.’ Registered by Ken Durio, Opelousas, Louisiana. (Relationships unclear, but 12 tepals suggest M. liliiflora x M. x veitchii). [M. x soulangeana, M. x soulangeana, M. sprengeri], cv. (Magnolia 33(1) [Issue 63]: 29, 1998). 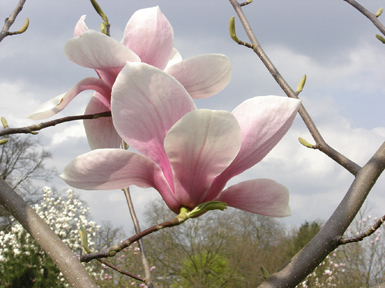 ‘This hybrid is a tree with strong apical dominance and branches with a semi-weeping character. The flowers are 10 to 11 inches across and have 8 or 9 tepals. Individual tepals are 5 inches long and 4 inches wide. The outside color of the tepals is very deep red purple, deeper and more red than ‘Deep Purple Dream.’ The hybrid was produced and named by Frank Galyon, Knoxville, Tennessee and selected in 1997.’ = M. x soulangeana cv. Deep Purple Dream x M. cv. Paul Cook. [M. fraseri], var. - The typical variety. [M. x soulangeana, M. x veitchii(? )], cv. (Wayside Garden catalog, p. 13, 1990, Hodges, South Carolina). ‘Tall slender pointed tepals are a vibrant reddish purple outside and a glistening white inside, reflexing slightly for a carefree effect; form and substance is pure perfection. 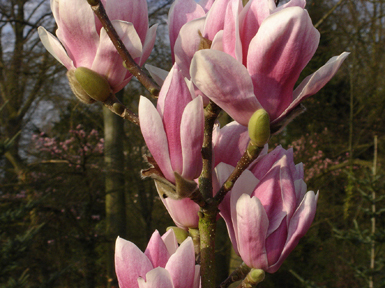 Another fast-growing Magnolia, ‘Full Eclipse’ grows 8 feet tall in just 2 years, and in 10 years is over 30 feet tall with distinctive columnar growth habit. One of the first Greshams to bloom, it flowers heavily throughout the whole season....’ Syn. : JG#30.